Fasting with Diabetes could lead to serious health problems for some people and you really need to know whether you fall on this category going ahead to fast. Also keep in mind fasting during the month of Ramadan is made compulsory for the healthier ones whereas the children, sick, older ones are exceptional cases. If You are a Diabetic patient please do confirm with your health advisor or diabetes team if you are fit enough for it before fasting. What happens when you fast with diabetes? Most of the diabetic patients are unaware of the health problems they could face during fast.There are two outcomes to it: Hypoglycaemia and Hyperglycaemia. When we skip food for more than 8 hrs at a stretch during fast , our body starts to use the energy stores to keep the blood glucose level normal. In such a case , diabetic patients who take medicines and insulin, could develop reduced blood glucose level known as Hypoglycaemia. This condition is identified by blood glucose level less than 70mg/dL. Hyperglycaemia is a case where there is high glucose level followed by heavy meals while breaking fast and having predawn meals. So it is clear that the diabetic patients need to be very careful during fast as any fluctuation in the glucose level could prove to be fatal in either way. Here are some of the expert tips shared by professionals to help those diabetic patients during the month of Ramadan. For Suhoor or Pre Dawn Meal, Eat Starchy Carbohydrates which release energy slowly such as Multi grain breads, Oat Based Cereals,Chapattis, Pita Bread, Semolina, Lentils, ruits and Vegetables. Do Not Over Eat and Drink Plenty Of Water. Try To Eat for Suhoor just before Sunrise or Prayer Call and not during midnight. Avoid Fried Foods and foods with high content of fats and Sugar. Drink Pleny Of Sugar Free Fluids at Suhoor and Ifthar. To Avoid Tiredness during Taraweeh Prayer Carry a bottle of Water and Glucose with You. Always Wear the Medical Bracelet for Diabetes Identification. Test the Blood Glucose level Often During this Month. If You feel sick during anytime of the fast, treat yourself immediately. If your blood glucose is less than 3.3mmol/l, end the fast immediately and treat the low blood sugar level. If your blood glucose level is below 4.0mmol/l at the start of the fast and you are on insulin or sulphonylureas (or any other medication that can cause a hypo), do not fast. 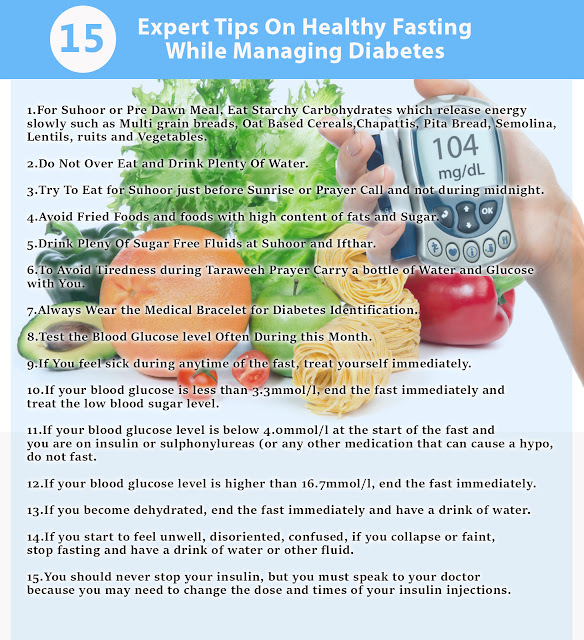 If your blood glucose level is higher than 16.7mmol/l, end the fast immediately. If you become dehydrated, end the fast immediately and have a drink of water. If you start to feel unwell, disoriented, confused, if you collapse or faint, stop fasting and have a drink of water or other fluid. You should never stop your insulin, but you must speak to your doctor because you may need to change the dose and times of your insulin injections.